Wall decor can be so hard, don't you think? And so pricey! Sometimes the perfect piece happens to cross my path, but with how little I actually shop these days, that approach is slow going. I made a patchwork shower curtain for this bathroom ages ago. I love it! It nicely pulled together all the colors in the room. While the shower curtain is still going strong, those ferny wall prints fell victim to the war on mold. Sad face. This week I've decided to make new wall art! I'll sew pieces, then wrap and staple them around brand new 9" x 12" canvases to give them the same frameless look as my old wall prints. Deciding to make replacements was the easy part. Deciding just what to sew had me stumped! I was tempted by so many patchwork-themed designs, but kept coming back to how nice the fern prints looked beside the simple patchwork squares of the shower curtain. The room needs something nature-oriented, rather than more geometric design, in my opinion. 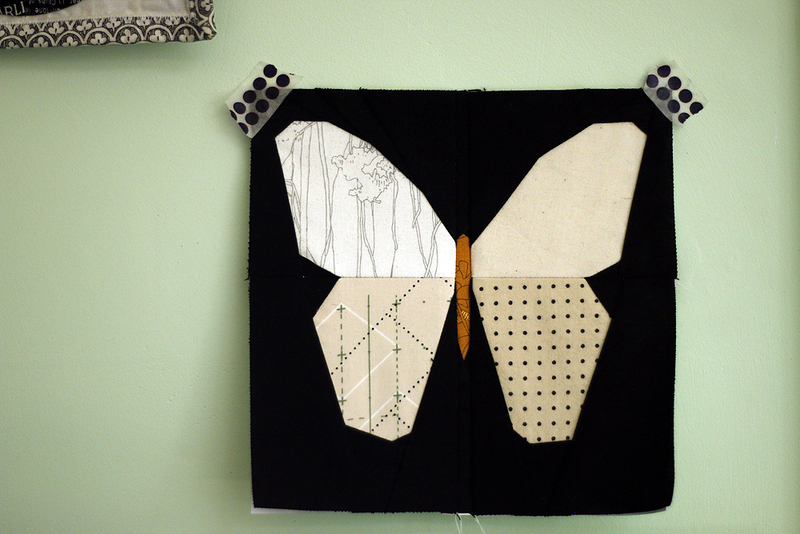 Eventually I decided to make paper pieced butterflies, using the 5" butterfly from Tartankiwi. I'm kind of kicking myself that I chose a paper pieced option, given the monster paper piecing project I have underway with Facing East. But this one, by contrast, is going to be straightforward and quick! I chose fabrics in the same colors as my original wall prints. The butterflies will be scrappy with 4 fabrics for the wings. I had to enlarge the pattern a bit, which is so simple when paper piecing. My blocks are 7" unfinished. Two down; one more to go. Then I'll add some solid fabric around to bring them up to size and finish these off. I need a finish!